First Financial of Baton Rouge is pleased to announce our new location at 5422 Galeria drive, Baton Rouge, LA 70816 as well as the addition of new staff members as we grow. We would like to welcome Donald Ford, CPA & Eugene Radcliff, Attorney. In the last 45 days, we have seen over 30 eligibility notices and payments. This increase is vast improvement from the last several years. We still have a long way to go, but we are definitely on the downhill slope. We ask for patience in the process and assure all of our clients who have claims that we are diligently working on all of your claims and will contact you when additional information is needed. As we move forward, keep in mind that the claims center is asking for additional information and supporting documentation that they did not ask for in the beginning stages of the process. We will call you as necessary. Usually we are working with the accountant, and if we get the requested information to them in a timely fashion, we can avoid additional delays. Please help us resolve these issues quickly and efficiently. Are your vendors paying slowly? Do you need capital for Expansion? Do you need new equipment? Or, do you just need extra money for peace of mind in meeting the everyday business demands like payroll & Materials? Read more in the article at the bottom of this newsletter. JW Construction Group, LLC, Owned by Keith Williams operates out of Baton Rouge, LA and holds Commercial License Certificate, Building Construction, Highway, Street And Bridge Construction, Heavy Construction, Specialty Solar Energy Equipment, Residential License Certificate licenses according to the Louisiana contractors license board. Through First Financial of Baton Rouge, LLC and our 10 other companies, we have used their services exclusively for all of our projects as well as my personal residential needs. They do extraordinary work and the value for the dollars is always exceeded. If you need any residential or commercial projects, call Keith and you will not me disappointed. For more information, call Keith at (225) 445-3069. First Financial of Baton Rouge, LLC has partnered with Capital South Lending, LLC (CapSouth)!!! Our clients have expressed again & again that they are not able to secure financing for capital for various reasons. CapSouth is quickly becoming the leader in Baton Rouge for commercial lending including its flexible and simple SBA programs. There is money available no matter what your situation with easy approvals and fast, fast turn around time. Capital South Lending was founded in 2007 by Coby Manuel to solve the age old problem faced by millions of small business owners: getting fast and simple access to working capital. With over 17 years of venture capital lending experience domestically and abroad, Coby understands what it takes to make a payroll, pay for inventory, marketing and all day to day operations without a reliable capital source. ( WE MAKE IT SIMPLE) was the goal of his management team and will continue to be the main focus for funding Capital South’s clients. With one of our strongest programs known as the SBA EXPRESS, we can assist your business without strong financials to get capital to help grow your company. We’ll give you the help you need, with a dedicated staff to assist with all your business loan needs we will begin to work immediately to loan you from between 5,000 to 350,000 in UNSECURED business financing. Stop passing up the opportunity to live your dreams. Start to grow and make more profit with your existing company by contacting Coby Manuel at 844-228-2491 are e-mail him at coby@capitalsouthlending.com for your pre-approval. Copyright © 2015 First Financial of Baton Rouge, LLC, All rights reserved. First Financial of Baton Rouge is pleased to announce the launch of our new website. Our new online presence will provide innovative insight into business consulting, monthly accounting, tax preparation and QuickBook advice to help grow your organization and meet your business goals. As of the last newsletter, we were waiting to hear whether or not the full 5th Circuit Court (En Banc) would hear BP’s arguments. On May 20, 2014, the 5th Circuit Court of Appeals ruled against BP by an 8-5 margin saying that they were in agreement with the earlier decisions. The second part of the denial was an order to start the payments again. BP appealed to the Supreme Court and asked that for a Writ of Certiorari, which would basically keep the payment injunction in place until the Supreme Court determined whether it would hear the case. Most experts feel that the likely hood that the Supreme Court will hear the case is a long shot. They receive over 10,000 requests per year, but hear only 80. On top of that, there are no constitutional issues involved. As of May 27, 2014, the 5th Circuit Court has ruled that it will not keep the payment injunction in place and the claim center is able to release payments again. This is wonderful news for all of us waiting on our claims to be finally settled! Let’s all keep our fingers crossed. The IRS estimates that 91% of the people who are paid 1099 (called contract labor) are employees and should be classified as W-2. This is a serious infraction and if you are caught misclassifying employees, the fine is substantial. Read more in the article at the bottom of this newsletter. Solid Ground Innovations LLC Possessing expertise in brand development, public relations, traditional and digital marketing, Solid Ground Innovations works to produce innovative strategies for client satisfaction. Whether it is refreshing a tired brand or website development, SGI caters to a vast area of new and experienced company needs by "fusing new technology with old techniques to produce superior results." For more information about SGI including its non-profit management arm visit www.sgicares.com or contact info@sgicares.com (225) 330-4924. 2. Does the business provide training to the worker? If you’re hiring a person for a job they are not trained for and providing them with the training to carry it out, that person is probably an employee. There can be exceptions based on the facts and circumstances. 3. Are the worker’s services a substantial or integral part of the business? This indicates employee status because it indicates the business maintains direction and control over the worker. 5. Does the business hire, supervise and pay the worker’s assistants? If so, this is a strong indication of employee status. 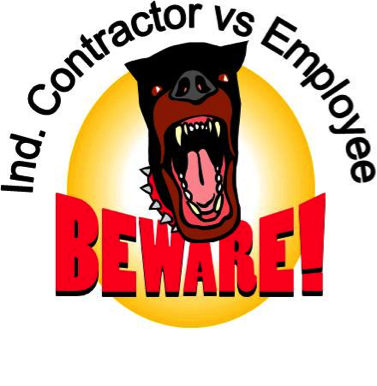 Let the independent contractor pay his or her own assistants. 6. Does the business have an ongoing relationship with the worker? This one is a stretch since many businesses maintain lifelong relationships with contractors whose work they like. But the IRS views this as an indication of employee status. 9. Does the business provide the workspace? Contractors who work off-site are more likely to be classified an independent contractor. 10. Does the business determine the order or sequence in which work is completed? Indicates employee status. If specific schedules are required, document them in the contract with the reasoning for doing so. 11. Does the business require oral or written reports? The IRS believes regular written or oral reports detailing the work completed indicates employee status. In reality, this is, and should be, expected from independent contractors as well. 14. Does the business provide tools and equipment for the worker? Independent contractors would normally provide their own tools and equipment. 17. Does the worker have multiple clients? Working with multiple clients generally indicates independent contractor status. If yours is the only or predominant business, then they are an employee. Copyright © 2014 First Financial of Baton Rouge, LLC, All rights reserved.